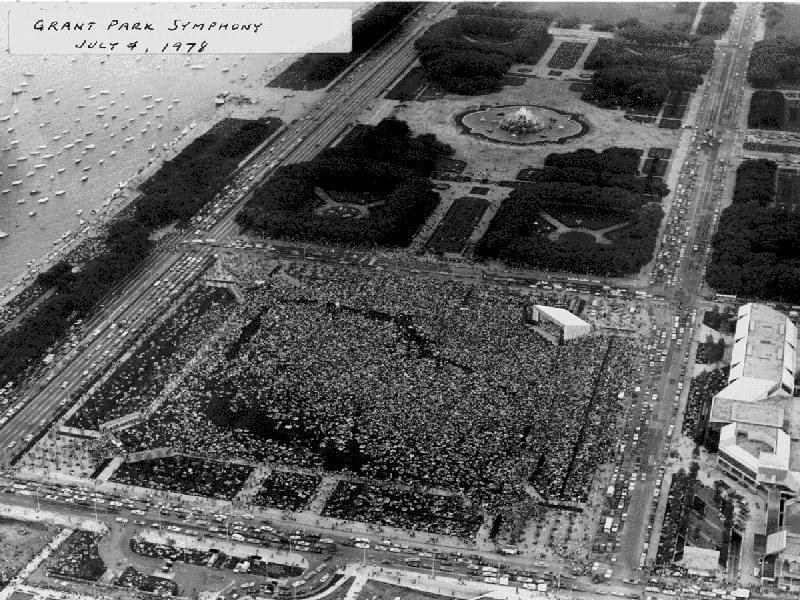 This photograph was taken at the dedication of the then new Petrillo band shell at Grant Park, on July 4, 1978. The shell was named after James Petrillo, who was president of the local musician's union for many years, and probably had more to do than anyone else with creating the Grant Park summer concert series. Masses of people turned out to see the combined Grant Park Symphony and Chicago Symphony orchestras play Tschaikowsky's 1812 Overture together on the same stage. The crowds you see here were comparable to what I experienced the two nights Van Cliburn played back in the late fifties. My brother Dale began playing cello in the Grant Park Symphony in 1974, so both my father (as a Grant Park musician, but recent CSO alum), and my brother played this concert together.